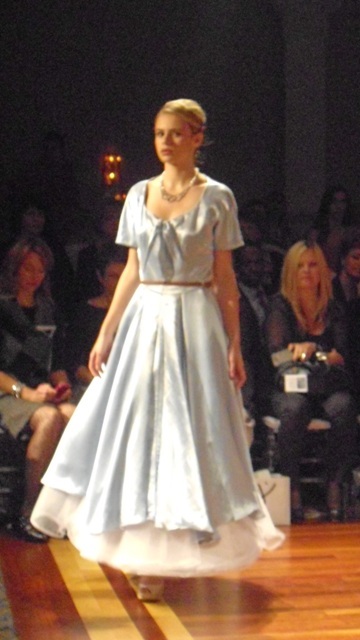 I could only attend the Sunday display at Ottawa Fashion Week. I was hoping to see promising ideas from Ottawa’s fashion creatives and I left assured that there is indeed talent evolving. I am a big supporter of creative people. Whether it be in science, technology, music or fashion – creativity is what moves us forward as a society. Change is always around us and creativity is how we adapt and evolve as a society. Otherwise we stagnate and wither. I attended on the Sunday of the Oct 2012 Ottawa Fashion Week show hoping to see the spark of local creativity that I see in many other artistic fields in Ottawa. 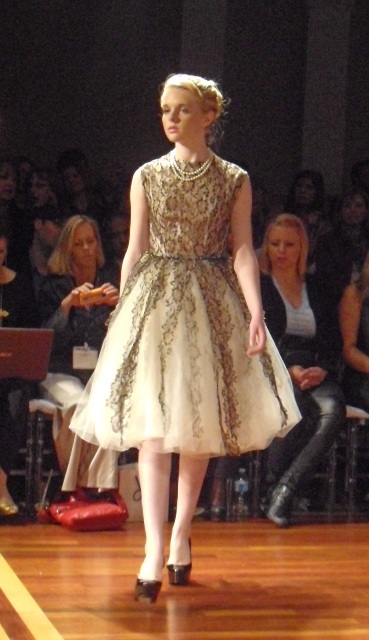 Ottawa Fashion Week is in its fourth year and gaining momentum. I felt it was time for me to see where this ‘scene’ was at. Sweetheart and I arrived in time to see Alice & Alishka on the runway. The very pretty fabric was designed into many different styles of dresses and skirts. There also an interesting combination of knits with some of the combos that added a different texture. Solace was very exotic. Shweta Wahi added an East Indian touch to her designs with great creative effect. Kudos to her for stretching our palettes in that direction. Elena Hinke’s Haute Couture absolutely blew me away. This was elegant fashion with a bold touch. The number and variety of outfits were stunning. The tailoring was impeccable. It is the kind of style that really pushes the traditional Ottawa fare – yet that is so dearly needed. 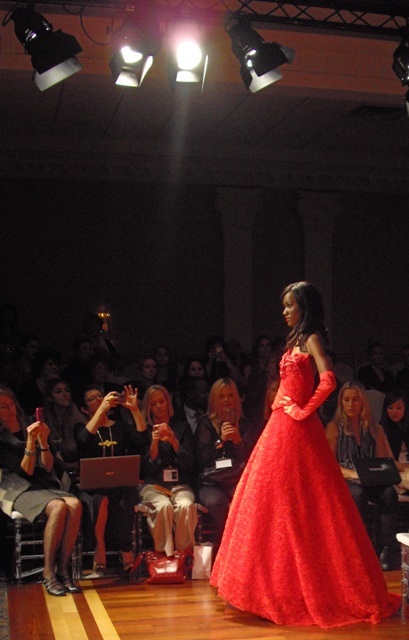 But my favorite for the evening was this glorious red mermaid dress…elegant, feminine yet slightly bold. Dare by Gwen Madiba was definitely in the contemporary realm. She was experimenting with some daring elements like spikes on the right shoulder of this dress. I feel that she can push it further. The star designer for the evening was Prophetik by Jeff Garner. 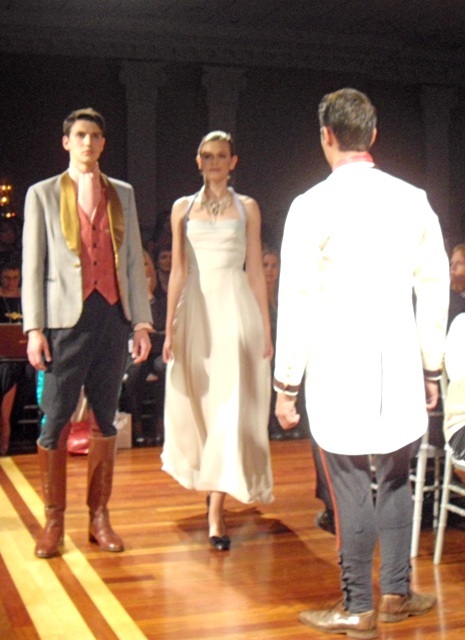 He professes to be a romantic designer with a sustainable organic label. 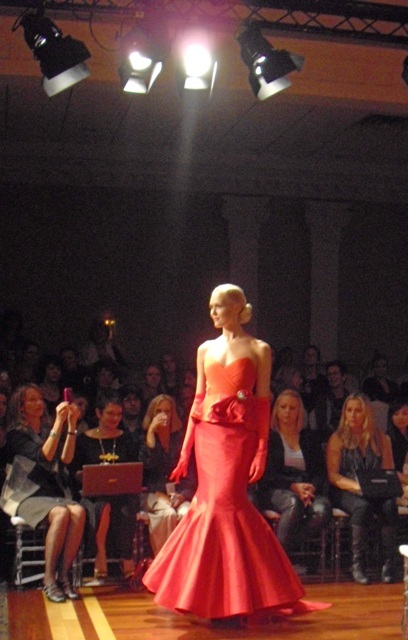 The show on Sunday was a tribute to Grace Kelly. It felt like you had gone up into grandma’s attic and found a trunk full of 1930’s – 40’s clothing. Lots of lace and colors from that era that speak of vintage. Sweetheart and I looked at each other when we left and committed to coming back for the next show. I love the local designers revealing their talent together in a show like this. I came hoping to find budding talent and I left with my imagination tingling.